As the only comprehensive text focusing on metal shaping processes, which are still the most widely used processes in the manufacture of products and structures, Metal Shaping Processes carefully presents the fundamentals of metal shaping processes with their relevant applications. The treatment of the subject matter is adequately descriptive for those unfamiliar with the various processes and yet is sufficiently analytical for an introductory academic course in manufacturing. The text, as well as the numerous formulas and illustrations in each chapter, clearly show that shaping processes, as a part of manufacturing engineering, are a complex and interdisciplinary subject. The topics are organized and presented in such a manner that they motivate and challenge students to present technically and economically viable solutions to a wide variety of questions and problems, including product design. It is the perfect textbook for students in mechanical, industrial, and manufacturing engineering programs at both the Associate Degree and Bachelor Degree programs, as well a valuable reference for manufacturing engineers (those who design, execute and maintain the equipment and tools); process engineers (those who plan and engineer the manufacturing steps, equipment, and tooling needed in production); manufacturing managers and supervisors; product design engineers; and maintenance and reliability managers and technicians. Each chapter begins with a brief highlighted outline of the topics to be described. Carefully presents the fundamentals of the particular metal-shaping process with its relevant applications within each chapter, so that the student and teacher can clearly assess the capabilities, limitation, and potentials of the process and its competitive aspects. Features sections on product design considerations, which present guidelines on design for manufacturing in many of the chapters. Offers practical, understandable explanations, even for complex processes. Includes text entries that are coded as in an outline, with these numerical designations carried over the 320 related illustrations for easy cross-referencing. Provides a dual (ISO and USA) unit system. Includes a chapter on sheet metalworking covering cutting processes; bending process; tubes and pipe bending; deep drawing processes; other sheet metal forming process (stretch forming, spinning, rubber forming, and superplatic forming and diffusion bonding). Provides a useful die classification with 15 illustrations and description; presses for sheet metalworking; and high energy-rate forming processes. 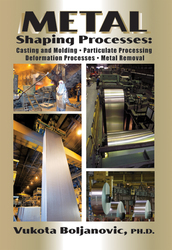 A chapter on nontraditional manufacturing process discusses such important processes as mechanical energy processes (ultrasonic machining, water jet cutting); electrochemical machining processes (electrochemical machining, electrochemical grinding); thermal energy processes (electric discharge processes, laser beam machining, electron beam machining); and chemical processes (chemical milling).